These bold blue fingerless gloves were made in Nepal by Sarita Sarijual. The gloves are available through purchase via Padhma Creation which has the goal of "empowering women one stitch at a time". Radiant ombre colored scarf. Tis the season to stay warm and be fashionable. Bid on this scarf for to give as a gift for someone or your self! Grab this brightly colored handmade scarf. The scarf is 100% cotton and was made in Nepal. Peruvian folk art dolls set of boy and girl Handcrafted cloth/plush figure with basket. Plus Peruvian Dancing Puppets. This handy dandy tote will get your stuff safely transported in style. Gorgeous fabric with beautiful cotton lining and five pockets to keep everything safe! 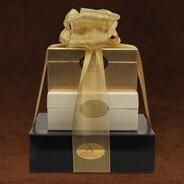 The Bridgewater Chocolate Tower is a three-tiered gift box that includes a 2 lb. Assortment box, 1 lb. Bark and Milk Shortbread. It's the quintessential holiday gift! 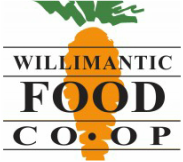 The Willimantic Food Co-op is a member owned and operated food store. They carry a full line of grocery items, produce, cheese, juices, grains, spices, vitamins, dairy products, homeopathic remedies, and paper goods. The store is open to members and non-members alike. Members pay shelf price and have the option of working at the store to receive an additional discount. Non-members pay 10% above shelf price. Signed copy of "Rockin the Bronx" by Larry Kirwan, CD and a Tshirt. Black 47 fans this is your package! An Irish American odyssee, this is an "Angelas Ashes" for a new generation. Amy Bloom is a New York Times Bestselling Author. She has graciously donated her newest book White Houses & the brilliantly written Lucky Us. Her stories have appeared in Best American Short Stories, Prize Stories: The O. Henry Awards, and numerous anthologies here and abroad. March can help a new generation understand that the arc of the moral universe doesn't just bend toward justice; humans must struggle to bend it. To read Lewis's graphic memoir... is to be reminded that what so many have taken for granted in American life today was hard fought and recently won. March calls on all of us to keep our eyes on the prize. A signed copy of Stanley Greenberg's book. Greenberg is a renowed pollster and was a key adviser to President Clinton. Rules for Revolutionaries tells the story of a breakthrough experiment conducted on the fringes of the Bernie Sanders presidential campaign: a technology-driven team empowered volunteers to build and manage the infrastructure to make 75 million calls, launch 8 million text messages, and hold more than 100,000 public meetings—in an effort to put Bernie’s campaign over the top. Behind the scenes at the protest heard around the world. Hardcover. In Just Kids, Smith brings the same unique, quality to Just Kids as she has to the rest of her formidable body of work—from her influential 1975 album Horses to her visual art and poetry. Winner of the National Book Award! Wajang, is a form of puppet theater art found in Indonesia and other parts of Southeast Asia, wherein a dramatic story is told through shadows thrown by puppets and sometimes combined with human characters. The art form celebrates the Indonesian culture and artistic talent; its origins are traced to the spread of Hinduism in the medieval era and the arrival of leather-based puppet arts called Tholu bommalata from southern India. The face of the watch depicts Dali himself, and his moving mustache serves as the watch’s hands. An ant marches around the rim of the watch, ticking off the seconds. The Dali Watch has a Japanese quartz movement and 1-year guarantee against melting over tree branches. Nickel-free zinc alloy case is 33 mm in diameter. Leather band. Not waterproof. Armed with household items instead of weapons, these soldiers carry out their domestic duties, in the fight for a normal life.